Some of the greatest contributions of New Fantasyland come in the scrappiest forms. Scrappy in the sense that they're A) overlaid existing attractions, B) Perhaps not the most loved previously. I'm talking mostly of The Barnstormer, which until this point we haven't discussed much on this blog. 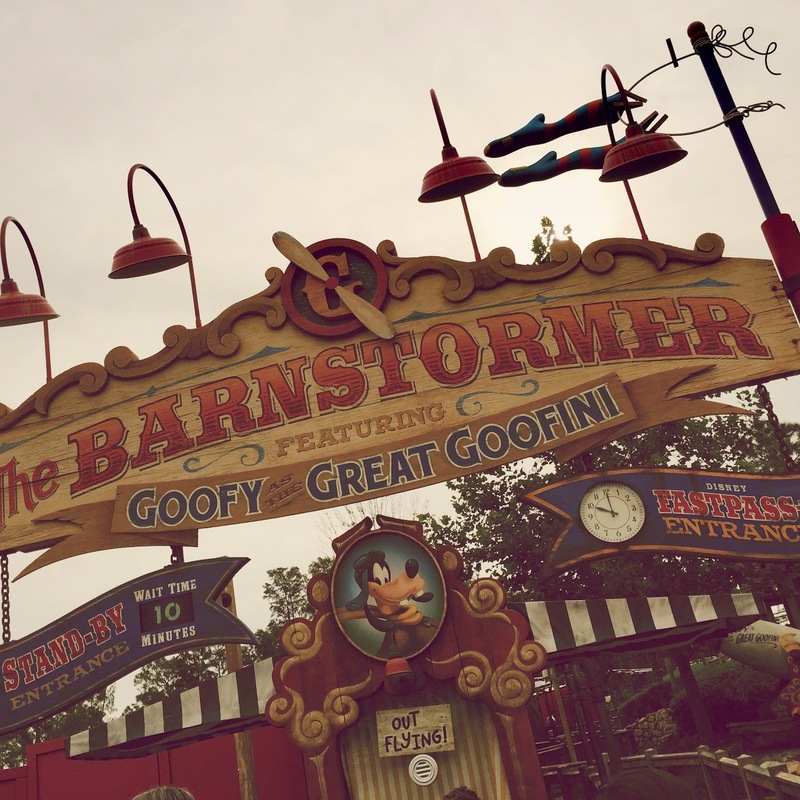 I love the current iteration of The Barnstormer, which is saying a lot since I merely tolerated the Toon Town version. The track is just the same, but everything else is 100% more adorable. The previous "crop-dusting" theme was very weird and never felt right, while the current Great Goofini as a daredevil theme works perfectly in the context of Storybook Circus. The previous Barnstormer was over the top, with primary colors as the focus. The over the top primary ethos was implemented in everything from the queue rails, to the over abundance of "funny" signs. This was true throughout Toon Town, but held particular prominence in The Barnstormer. As an off the shelf coaster the overlaid theme is particularly important to the reception of the experience. Great examples being Space Mountain and Primeval Whirl...which are both basically the same ride. Their different overlaid themes create such different experiences that each coaster is on the far end of the spectrum of guests love. (For the record, I love both attractions quite a bit.) So it seems the old Barnstromer was doomed from the start. Where do we get the idea that putting up more signs makes something more themed? Why do we need to scream at the guests? HAVE FUN! SEE HOW WACKY THIS PLACE IS! THIS IS CRAZY! (right?) The whole concept and implementation of the previous theming felt desperate and insecure. The fact is that the attraction WAS fun, it WAS wacky, but that was all lost in the tackiness of it all. It went too far trying to woo us. Currently the soft earthy rusted tones add gravity to the ride...this is a cartoon, yes...but not in Toon Town. No longer is the stroll through this corner of the park jarring. It feels real. The Barnstormer, along with the rest of Storybook Circus, are no longer the awkward cousins sitting in the corner on Thanksgiving. Storybook Circus is such a welcome breath of fresh air, I can hardly believe it actually exists. But thankfully it does.